The Brazil nut (Bertholletia excelsa) tree is enormous; frequently reach of 40 to 50 meters height or more, and it can reach ages of 500-800 years old. This tree is native in many northern parts of the South American continent, like Guiana, Bolivia, Venezuela, Brazil, Peru, Colombia and Ecuador. Madre de Dios is the only area in Peru where this kind of tree grows. Between December and March , the coconuts fall from the tres , and the collector of the nuts ( known as Castañeros ) move to the middle of the amazonian forest in order to recollect the Brazil Nuts. The fruit is a large, round woody capsule or pod, about the size of a large grapefruit and weighing up to 2.2 kg. The fruit pods grow at the ends of thick branches, then ripen and fall from the tree from January to June, usually with a loud crashing sound as they fall 50 meters through the canopy like cannon balls. Inside each fruit pod, wedged in like orange segments, are 12 to 25 Brazil nuts, each within its own individual shell. 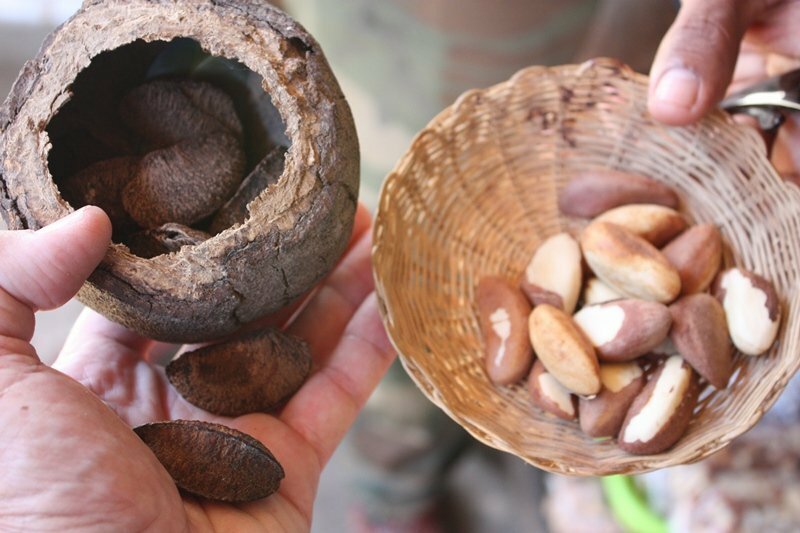 Mature Brazil nut trees can produce approximately 300 or more of these fruit pods annually. The Brazil nut is, in fact, a seed rather than a nut, but popular usage continues to prevail. Nutritionally, Brazil nuts are an excellent source of selenium and a good source of magnesium and thiamine. They are 14% protein, 11% carbohydrates, and 67% fat3 . The fat breakdown is roughly 25% saturated, 41% monounsaturated, and 34% polyunsaturated. The absolute saturated fat content of Brazil nuts is among the highest of all nuts, surpassing even macadamia nuts. 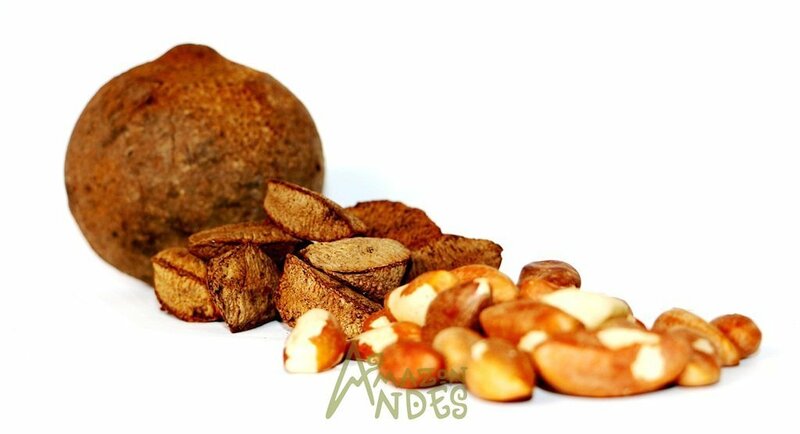 The proteins found in Brazil nuts are very high in sulfur-containing amino acids like cysteine (8%) and methionine (18%) and are also extremely rich in glutamine, glutamic acid, and arginine. The presence of these amino acids (chiefly methionine) enhances the absorption of selenium and other minerals in the nut. The Brazil nut is a three-sided nut with white meat or flesh that consists of 70% fat and 17% protein. 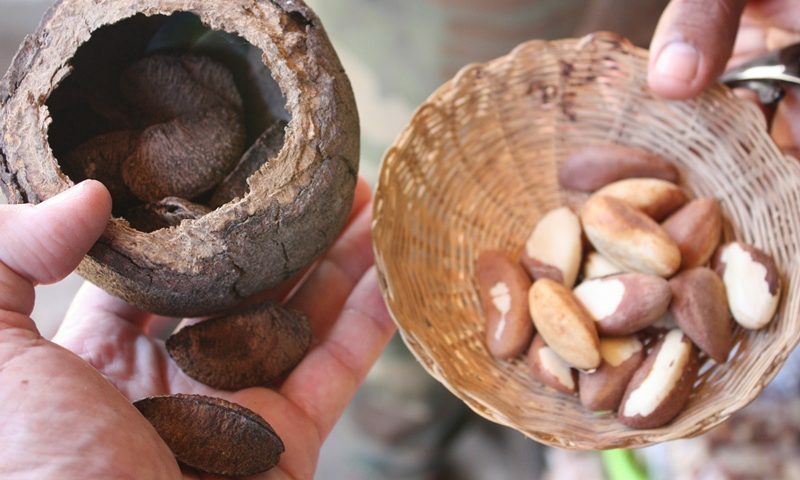 For centuries the indigenous tribes of the rainforest have relied on Brazil nuts as an important and significant staple in their diet - so important, that the nuts have even been used as a trade commodity, much like money. Indigenous tribes eat the nuts raw or grate them and mix them into gruels. 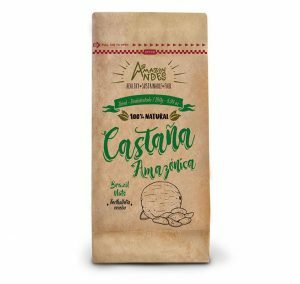 In the Brazilian Amazon, the nuts are grated with the thorny stilt roots of Socratea palms into a white mush known as leite de castanha and then stirred into manioc flour. This food is a valuable source of calories, fat, and protein for much of the Amazon's rural and tribal peoples. With such a high oil content, fresh Brazil nuts will even burn like miniature candles when lit. The oil is extracted from the nuts and used by indigenous and rural people for cooking oil, lamps, soap, and livestock feed. The empty seed pods, often called "monkey's pots," are used to carry around small smoky fires to discourage attacks of black flies, as cups to collect rubber latex from tapped trees, and as drinking cups. The husks of these seed pods have also been used in Brazilian folk medicine to brew into tea to treat stomachaches, and the tree bark is brewed into tea to treat liver ailments. a handful of Brazil nuts provides around 10% of the recommended dietary intake of fibre or 2.6g fibre per 30g serve.6, 7 Fibre is important for digestive and heart health, and can help to manage blood glucose levels. a handful of Brazil nuts provides around 9% of the recommended daily intake for men and more than 20% of the recommended intake for women.6, 7 Zinc plays many roles in the body but is particularly important for healthy skin and hair, reproductive health and a healthy immune system. Their high caloric content chiefly comes from their fats. However, much of this fat content is mono-unsaturated fatty acids (MUFA) like palmitoleic acid (16:1) and oleic acid (18:1) that helps lower LDL or "bad cholesterol" and increase HDL or "good cholesterol" levels in the blood. Research studies suggest that Mediterranean diet that is rich in monounsaturated fatty acids offers protection from coronary artery disease and strokes by favoring healthy blood lipid profile. contain about 7.87 mg per 100 g (about 52% of RDA). Vitamin-E is a powerful lipid soluble antioxidant. It is required for maintaining the integrity of cell membrane of mucusa and skin by protecting it from harmful oxygen-free radicals. 100 g nuts provide about 1917 µg or 3485% recommended daily intake of selenium, rating them as the highest natural source of this mineral. Selenium is an important cofactor for anti-oxidant enzyme, glutathione-peroxidase. Just 1-2 nuts a day provides enough of this trace element. Adequate selenium in the diet help prevent coronary artery disease, liver cirrhosis, and cancers. is an excellent source of B-complex group of vitamins such as thiamin (51% of RDA per 100 g), riboflavin, niacin, pantothenic acid, vitamin B-6 (pyridoxine), and folates. Altogether, these vitamins work as co-factors for enzymes during cellular substrate metabolism inside the body. In addition to selenium, they hold very good levels of other minerals such as copper, magnesium, manganese, potassium, calcium, iron, phosphorus, and zinc. Copper helps prevent anemia and bone weakness (osteoporosis). Manganese is an all-important co-factor for the antioxidant enzyme, superoxide dismutase. Brazil nuts contain around 4g protein in every handful (30g).6 Arginine is an amino acid building block of protein which is converted to nitric oxide in the body. Nitric oxide causes blood vessels to relax and remain elastic, and helps prevent blood clotting. Hardening of the arteries and blood clotting can lead to heart disease. Brazil nut allergy, like other tree-nut allergies may occur in some sensitive individuals. The reaction symptoms may range from simple skin itching (hives) to severe form of anaphylactic manifestations, including breathing difficulty, pain abdomen, vomiting, and diarrhea. Cross-reactions may occur to some other nuts and fruits, especially of Anacardiaceae family such as mango, cashew nuts, pistachio...etc. Persons with known allergic reactions to any of these nuts may, therefore, need to observe caution. Excess consumption of these nuts may result in selenium toxicity. Oftentimes the symptoms may be severe, including nausea, vomiting, garlic odor in breath, emotional disturbances. Other likely manifestations may include dental caries, alopecia (loss of hair), neuropathic pain, dermatitis...etc. It is, therefore, advised to eat only few nuts (2-4 nuts) per day (each nut weighs about 5 g). Brazil nuts with fresh dates for an after dinner snack to satisfy your sweet cravings or pop a Brazil nut inside a pitted prune for a sweet crunchy surprise. For an antioxidant-rich meal, combine your favorite pasta with broccoli, sundried tomato and Brazil nut pesto. Chopped Brazil nuts are great added to cereal or yoghurt. For a change from peanut butter, try ABC spread (a combination of almonds, Brazil nuts and cashews). Brazil nut burgers – combine Brazil nuts, red kidney beans, grated carrot, parsley, spring onions, lemon juice and garlic in a food processor. Form into patties and cook in a frying pan or BBQ using a little olive oil. Serve on a wholegrain roll with avocado and salad. Add Brazil nuts for a nutty variation on your favourite fruit cake. Combine chopped Brazil nuts with fresh breadcrumbs, herbs and egg to make a tasty Christmas turkey stuffing or use to coat fish or chicken. Add chopped Brazil nuts to herbs and use to stuff mushrooms. The Brazil nuts has different presentations according to their different processes, but has proven effective in each use.